I am interested in hearing what you have to say about tire balancing. The dealer who sold me my coach had new michelin tires installed but the tire vendor used the "powder balance" when doing the job. They failed to use the proper valve stems (left the originals) valve screens or caps! On my first trip I learned the hard way that this causes leaks and all sorts of problems including powder in my face! I would like to go back to lead weights from a reputable dealer. Have you folks had good luck with weights? Is powder all that better despite the related inflation issues? Any recomendations are appreciated. I've only used weights to balance coach tires since 1978. I have had excellent results and no problems. Smooth riding tires for their entire life. Weights are the only way to balance tires, however you must go to a reputable tire dealer that can do it correctly and that his machine is accurate. Actually the best way to balance is to spin balance the tires while on the vehicle. Usually truck tire dealers do this as I just had mine done at a Michelin dealer in Springfield, Missouri. They also check for wheels being out of round which is common with steel wheels that is why truckers have aluminum wheels on the front. Balancing the rear is not so critical. Dave, I purchased new mich tires from a goodyear dealership when I was away from home after a tire failure, and other tires were old. they used the powder system. I didnt like the ride. when I got home to Houston I called the co I use to work on chasis as they service most of Houston's bus lines. They removed all the powder, some of which was clumping because of moisture from air systems used to air up tires. they balanced all tires while on the rig using weights. Ride seems better. They said never use the powder system as most compressors systems are not properly filtered to eliminate moisture from getting inside and clumping the powder. Forget the weights, forget the powder, forget the balancing rings, or whatever else might have been used in the past. I will only use the Dyna Beads in my coach tires. AND I just had them installed in my trailer tires because I was switching out the old steel wheels for a set of almost new aluminum mag wheels. This is actually the best time to install the Dyna Beads as the package just gets dropped into the tire before inflating the tire onto the rim. Otherwise, you have to pour them through the valve stem opening. This is fairly new technology, but not recent and has been used very successfully for all types of tires and situations. I will not use anything else. 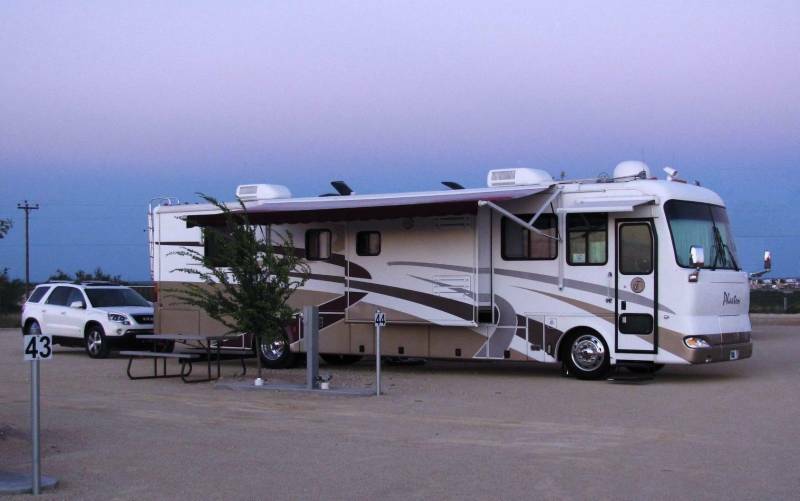 if you intend on using them in your coach tires, use the RV packages which are larger beads. I believe they are 2mm in size. The beads for the normal size tires are 1mm in size. I have also installed filtered valve cores in the stems to insure they don't get lodged in the valve stem. Also, you can Google "Dyna Beads for Tires", and I would also suggest doing a search on this forum for other discussions about tire balancing and Dyna Beads. Just picked the coach up from Beasley Tire in Houston (one of the larger commercial operations) and they found Equal powder in the tires without the proper valve stems or cores. This product was removed, new stems were installed, and the tires were balanced on their normal heavy duty machine. In all honesty I cannot detect any difference in the ride or performance of the tires. I did not have a balancing problem I had an inflation problem. I feel better knowing that they are done the tried and tested way, and perhaps I will not have any more air pressure issues or deflated tires. I am in the process of seeing that the dealer makes good on paying for this problem. I will certainly post the dealers name and response once they have had time to make a decission. I had an inflation problem. Air pressure loss could well have been through the non compatible valve stems with the material stuck in the conventional valve stem after you checked tire pressures. I am interested in hearing what you have to say about tire balancing. Personally I like the idea of dynamically (spin) balancing the wheel/tire assembly using weights. Both dealers I purchased tires from this past year (Firestone on drive axle and Michelin on steer axle) recommended and performed spin balancing. They had the granular (sand, powder, beads, etc) products available. That said, what I don't see discussed much is truing tires. Truing involves mounting the wheel/tire assembly on a machine similar to a brake drum lathe and taking a cut across the face of the tread to ensure that the tire is actually round. My sense is that truing and spin balancing are not found in every shop that sells large truck tires and alternative methods are promoted as substitutes. Even with the very best of balancing with wheel weights front tires can still develop cupping normally on the outside edges. Over the road trucks have tires made specially for in town use with heavier closed block thread on the outside edges, granted this type of driving and tire design would be extreme considering the lack of in town door to door delivery type driving a RV just does not do. My point with this is if cupping or rivering of a tire thread (such as in Good Year) does happen I don't feel stick on weights can compensate for the wear unless they are rebalanced. I've never tried the beads but once I can find some aluminum wheels and get them mounted that's what I plan on using versus the Equal that I've used in my trucks for years now. Now if I could only find some Alcoa's. Yes the deflating was the result of the wrong valve cores. Sadly, I did not know that the powder was in the tires when I bought the coach. Part of my sales contract was that the dealer would install all new Michelan tires from a local dealer. I tried to influence who they would use, but it really was not my call. The first time I went to check tires before my first day trip, I had all kinds of leaking air and found two tires at about 40psi! It was a long battle to get sufficient air in those tires. Without boring everyone with the details, I finally took the coach to Beasley and made the decission to switch to weights. I researched on this site and several other places, but in the end, chose to go with what I understood. I will say that in my research the Dyna Beads sound pretty good. I just hope I can maintain proper air levels now!! I just put 6 Sumitomo's on my coach and used Magnum beads. Couldn't be happier. I used the beads for several years and liked them. In 2010 I had all new Michelins installed and have no beads or weights and I have no imbalance so far. If an imbalanc occurs I will have the beads installed. When my rig was new it had stick-on weights and I managed to lose two of them within a year. I bought Centramatic automatic wheel balancers for my motorhome, they work great. After 2 trips to 2 different tire shops to balance the tires, I gave up and bought them. Many truckers and friends use them on larger tires.